Elisa Corcoran was all smiles as she claimed a bronze medal for DCU at the Irish Intervarsity’s Golf championship in Rosapenna, Co Donegal. The 19-year-old from Rathfarnham described the result as an absolute joy and honour and hopes there is more success to come for her in the near future. “It was unreal to represent the college at that level. After round one I was coming last. It was a tricky course and I quickly had to adapt to it, but I made sure I wasn’t coming home without a medal,” Corcoran told The College View. Corcoran described herself as quite a sporty individual growing up playing camogie, football, tennis and swimming. She began playing golf at the age of ten when her father bought Corcoran her first set of golf clubs. “I remember going out to the back garden and just hitting a few golf balls around. It felt natural to me. I quickly started moving onto the local golf course and partaking in competitions. I had and still have an absolute love for the game,” Corcoran said. Her coach, Dave Kearney, could see the talent in the then 12-year-old and began coaching and driving Corcoran to be the best she can be. Alongside her recent bronze medal, Corcoran has stated her greatest achievement in golf was being able to represent Ireland and play at the Under 18 Home Internationals in Lanark Golf club in Scotland in 2016 where she won two out her three match plays with Ireland coming second in the competition. 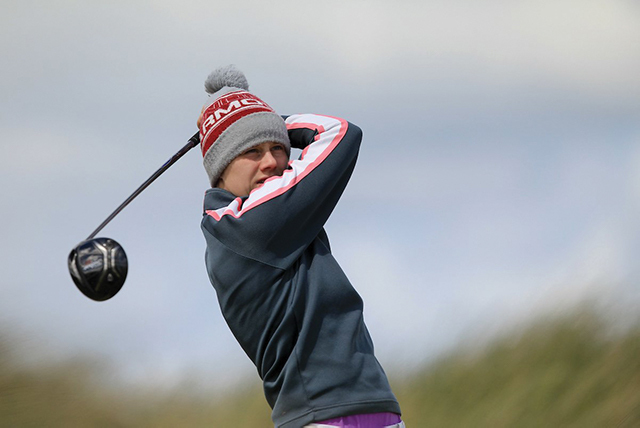 More recently Corcoran played in the 2018 Amateur Women’s Irish Open in Co Louth where she claimed a top ten finish. “That was a huge lift for me as I only recently came back from a shoulder injury, I was in such pain that I was thinking about pulling out of the competition all together the week before, so I was extremely surprised with the result I got,” said Corcoran. Today Corcoran is lingering one shot off a scratch golfer with a world Amateur ranking of 932. Her routine consists of continuous practice on the course and building the small details of her game off the course such as gym work, core work and proper dieting. Elisa did admit however that she has more work to do before she reaches the next level of the game. “Ken Robinson at DCU and Dave Kearney are always driving me on. I hope in the next ten years to reach the international circuit for women’s and who knows maybe professional if it turns out for me,” said Corcoran. Image Credit: Irish Ladies Golf Union.